sailboat. : Five Things I Love Friday 015. I seem to go through phases with Tumblr, sometimes I adore it and sometimes I simply don’t log in for months at a time. Right now however I absolutely adore it! It has its issues with owners of images not always getting proper credit for their work and that does bug me, but there are so many stunning photographs and pieces of art packed into one website that’s ever expanding, there’s something about it that’s just incredibly inspiring. Do any of you have a tumblr account? You can follow me here if you’d like to! I’d love to discover more people to follow! I’m a firm believer in that when something is meant to be, it will be no matter what. Of course relationships are never all sunshine and roses, there is always at least one difficult patch you’ll have to go through at some point, even if that difficult patch only lasts a day. I know I sometimes make things more difficult than they have to be, I do get jealous easily and I am a little bit insecure within myself. I’m only 22, I don’t properly know where my life is heading & I think sometimes people can play to others insecurities, which isn’t right. I do struggle when I think someone else says something to my boyfriend that I think is a little inappropriate. He’s mine, you know? I’ve never felt so at home with someone ever before. Please stop it. I’m not going to let anyone ruin this. Three. This beautiful Motel dress. Sometimes you spot an item of clothing that seems to manage to completely epitomise your personal style & this dress does that for me. I adore everything about it apart from the fact it's super duper short. A couple more inches on this beauty and I would have had to have made it mine! I will admit to falling behind on both the Harry Potter books and films. I’ve only read up to book number four and I feel like I’ve missed out on so much! Another part of me is kind of happy that I’m not done though, when I was younger this series was so incredibly magical to me and I’d dream of getting my Hogwarts letter delivered and jumping on the train into a whole other world and by having not finished the series, that magic is still kind of alive to me. 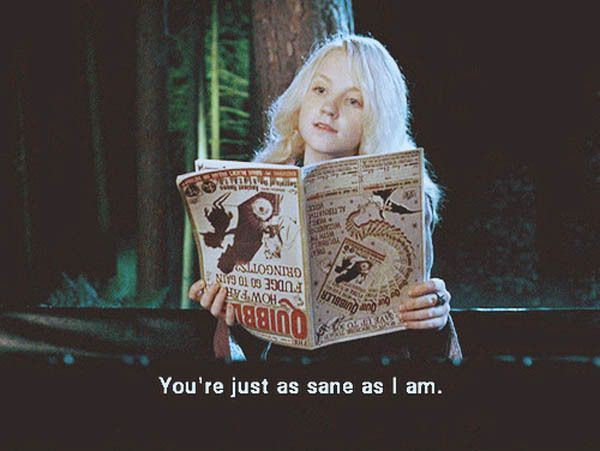 Apart from Ron, my favourite character is Luna Lovegood. I just think she’s wonderful! Today those words describe me perfectly, but I mostly love the illustration itself. If I could choose one talent to have it would absolutely be the ability to draw. One. tatty boots. Two. Little Mittens. Three. ghostparties. Sometimes it's impossible to find the original source of an image, so if any of my links are incorrect or you know to whom the image belongs then please feel free to point me in the right direction! Thank you. I am so the same with tumblr, I have been obsessed for a few months now but before that i would go in phases of hating it and not going on it and then loving it too much! Wish you luck with #2! I know what you mean; he's mine, back off! And I love Luna Lovegood as well <3 she's a doll. So you've not read the seventh book yet? It's by far the best in the series and one of my favourites of all time! I'm a bit the same with tumblr, I go through days of not going on it then I can spent 4 hours reblogging stuff! I'm with you on that Tumblr issue, I'm like that as well... But, I love the pictures, so I just reblog. Following! && Love your this post by the way! Oh wow, thank you for the link! really grateful! That illustration is wonderful and we all have our insecure days, it just makes us human I think. I've missed out on a lot of harry potter also, but it does feel strange that its come to an end! Luna's my fave too - I used to work with someone exactly like her. Actually she was sort of a cross between Dobby (my other fave) and Luna. Aww don't be so I secure u are beautiful! At least ur classy enough not to say something, unlike me when girls try to hit on my guy lol! I think it takes a good year of living together to really get very accommodated to each other too! I wish u a the luck Hun! I agree with this all, especially Luna Lovegood! You would look BEAUTS in that dress too, so sailor-esque! 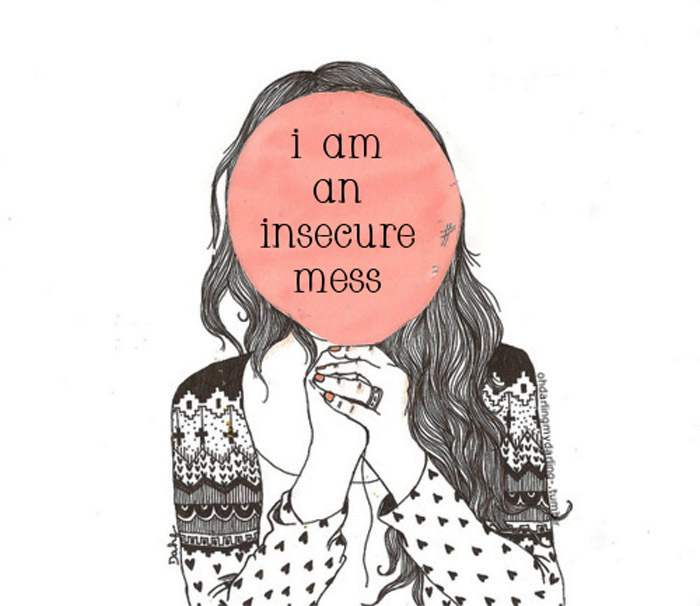 Thank you for the mention, and i would defs describe myself as an insecure mess HA! xo.